Student News, H. Peter Steeves on Campus, & More! Today in Student News, we’re excited to announce that not one but two current MAWP students will have poems published in After Hours Issue 27, Summer 2013. The Summer 2013 issue will be released at the Printers Row Book Fair, June 8-9th; if you’re at the fair, stop by the After Hours table to pick up a copy and check out David and M.R.’s poetry! The DePaul Humanities Center would like to invite you to its next on campus event. 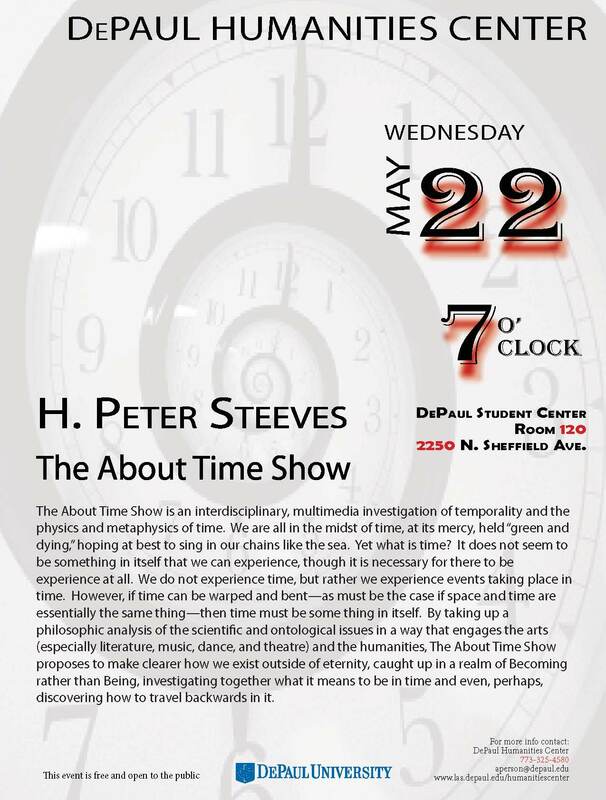 H. Peter Steeves will be presenting “The About Time Show” on Wednesday, May 22nd, at 7:00 p.m. at the DePaul Student Center, room 120. From the flyer: “The About Time Show is an interdisciplinary, multimedia investigation of temporality and the physics and metaphysics of time. We are all in the midst of time, at its mercy, held “green and dying,” hoping at best to sing in our chains like the sea. Yet what is time? It does not seem to be something in itself that we can experience, though it is necessary for there to be experience at all. We do not experience time, but rather we experience events taking place in time. Soft Skull Press, an imprint of Counterpoint press, is hiring! They are looking for a Publishing Assistant to join their team. This is an entry-level position based in Counterpoint’s Berkeley, CA offices. If you are interested, please send a cover letter & résumé to: pubasstjob@counterpointpress.com. The Artifice, an online magazine that covers a wide spectrum of art forms (including Film, Anime, Comics, Literature, Arts, etc. ), is actively looking for new writers. The website is collaboratively built and maintained by its writers. While writing for The Artifice does not pay, the platform has an established audience of millions. The Artifice is currently expanding and would like to provide an opportunity for students to join their team of writers. Any questions can be addressed to Alyson Burston at editor@the-artifice.com. To apply online, visit the-artifice.com/write. 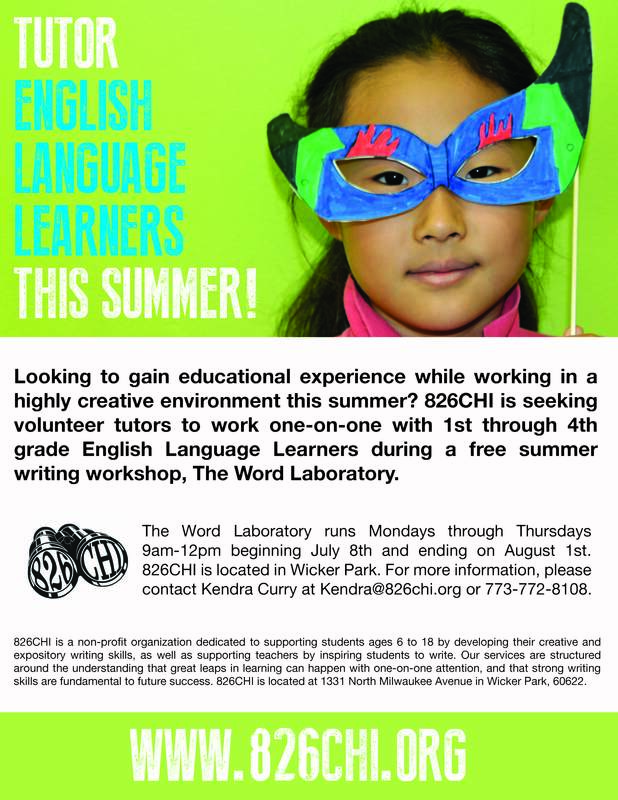 826CHI’s upcoming summer ELL workshop, The Word Laboratory, is seeking volunteer tutors to work individually with 826CHI’s youngest learners (1st through 4th graders) as they practice all of the great skills they have gained this school year. Those interested would need to be available to volunteer a few hours a week between July 8th – August 1st, 2013. There are many volunteer slots yet to fill. No previous experience with ELL students or special language skills necessary – just a strong interest in working with kids in a creative/educational setting. For more information, visit www.826chi.org. To apply, please contact Kendra Curry, Director of Volunteer Services, at Kendra@826chi.org.